Kitchen! Kitchen! 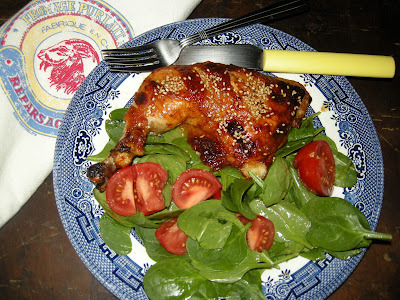 : "chicken barbecue" oven baked style.....at kitchen! kitchen! "chicken barbecue" oven baked style.....at kitchen! kitchen! One of my "basic ingredients"
on my adventure to Korean dishes. ﻿ I have been an avid follower of the "Kimchi Chronicles", a show on PBS hosted by Marja, Jean-Georges Vongerichten's wife. Part travelogue and part food fantasy of all Korean dishes that your mouth waters just watching all those wonderful dishes being whipped up on the small screen. I craved to be in Korean town in NYC that very moment and taste every single dish that I see on the screen. (impossible of course). Although the name of the dishes are a bit of a tongue twister, it did not stop me from buying the basics of Korean cooking. So, here I was with my "chicken barbecue" baked oven style with one of my basic ingredients for a taste of the "kimchi chronicles" in my own kitchen, my way. *Optional: 1 heaping tbsp. 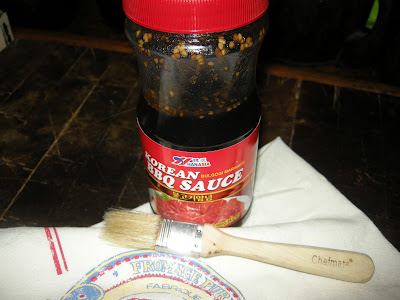 of korean chili paste stirred to the sauce* (for the more adventurous like myself). Season the chicken with the dry rub inside out sparingly (the sauce is salty already), rub the minced garlic & ginger all over the chicken. Pour the1/2 cup of barbecue sauce all over the chicken and let sit for about 20-30 minutes. Put in a baking sheet covering it with foil and bake in a 375 F preheated oven for 40 minutes (turn over after 20 minutes and pat the chicken with the juices); uncover after 40 minutes and continue baking for another 20 minutes and broil to brown. Pour over the leftover juices in the pan to the chicken and serve with rice and some kimchis (if you are brave enough). Or simply nestle the chicken on a bed of your favorite salad. Sprinkle with toasted sesame seeds.